WASHINGTON (CNN) -- The U.S. Army will report Thursday the highest level of suicides among its soldiers since it began tracking the rate 28 years ago, CNN has learned. The Army is expected to announce a new effort to study soldier suicides and links to post-combat stress. The confirmed rate of suicides was 20.2 per 100,000. Army officials were reviewing the suspected suicides Wednesday. If any of them are confirmed, the rate will rise. 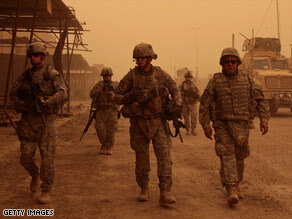 In 2007, the Army reported 115 confirmed suicides, the highest level since 1980, when it began tracking suicides. The Army is expected to announce a new effort to study the problem and determine why its suicide-prevention programs appear not to be working, and the extent to which post-combat stress may be a contributing factor. Many of the suicides occur after troops return home. The Army has long cited personal stress -- including financial, relationship and substance-abuse problems -- as the major reason for suicides, but it is also studying the extent to which deployments to a war zone may play a role. Last month, Army officials said the nation's suicide rate was 19.5 people per 100,000, a 2005 figure considered the most recent. Military officials have long said it is difficult to compare the military suicide rate with that of the private sector because of demographic differences and overall human stress factors. Another factor is that military suicides tend to be young men with access to weapons. He said his son had not been able to get the treatment he needed from the Veterans Administration. "What is disappointing is that the intervention doesn't appear to be there at the present time," he told CNN in a telephone interview from his home in western Massachusetts. The government settled with the family for $350,000. "The foolish part of all this is we just wanted someone to say they did wrong," he said. "But no one would until recently." Lucey said the U.S. attorney, acting on behalf of the Veterans Administration, told him his son's case had led the VA mental system to be changed. Fear of stigma also may have played a role in making his son reluctant to seek professional help. His son, Lucey said, was afraid that getting mental help would affect his chances of getting a job as a state trooper. Apparently it did not. "A year after he died, they accepted him," the father said. CNN Pentagon correspondent Barbara Starr contributed to this story.